Give your skin, hair and beard a treat with the range of grooming products from Daimon Barber. Discover the innovative range here at Mankind. Founded by Leo Neelands and Steve Crosby, Daimon Barber was created based on the realisation that a range of men’s beauty products needed to set a new standard for innovation, quality and lasting effect. The range provides men with products that span across hair, skin, beard and fragrance, creating a one-stop-shop for all grooming products a man could ever need. 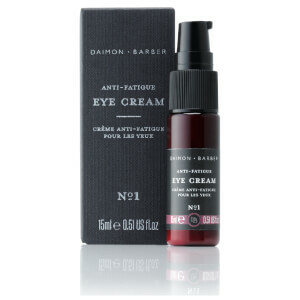 The Daimon Barber Anti-Fatigue Face Cream is the ideal product if you’re looking to treat tired and stressed skin. The cream is fortified with Myramaze to help rejuvenate the skin. The formula is light, non-greasy and absorbs effortlessly into the skin. The Anti-Fatigue Face Cream is also enriched with Murumuru Butter and Coconut Oil to help nourish the skin, whilst restoring softness without leaving any oily residue. Make sure you also check out the Anti-Fatigue Eye Cream, the Honeybee Complex and Propolis Face Wash and the Protect and Restore Facial Concentrate. If you’re looking to feel like a new man, the Daimon Barber Exfoliating Cleanser will be the perfect addition to your skincare routine. It’s infused with fine Pumice particles, to help gently buff away any dead skin and dry patches. Combine this with the Honeybee Moisture Complex and you’ll receive long-lasting hydration, with antioxidant protection. The exfoliating particles help lift facial hair, allowing for a more close and comfortable shave.